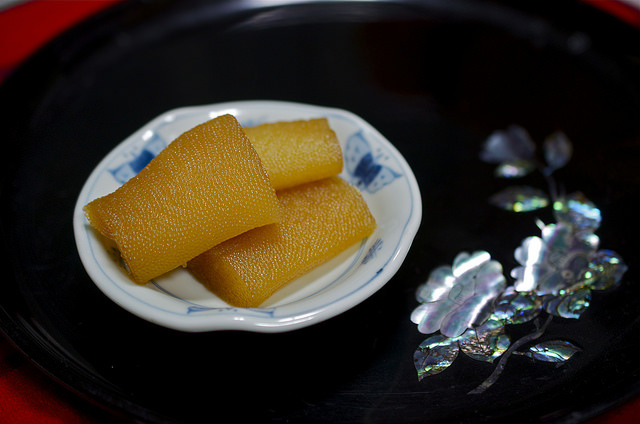 Datemaki is delightful addition to any New Year’s feast in Japan. Rather like a posh tamagoyaki, it’s flavoursome and unique. It’s associated with a wish for scholarship as it resembles a scroll. We like it so much, we’ve devised our very own recipe which we’d love you to try out. Available at our fish counter, kazunoko, otherwise known as herring roe, is often eaten at New Year’s because it is said to bring about the increased likelihood of having children in the following year. Whether you want kids or not, kazunoko makes a tasty accompaniment to fluffy white rice! In contrast to the revelry enjoyed in Western countries, New Year’s Eve is a far quieter, family oriented affair in Japan. It’s the time for reflection and the time to eat SOBA. The delightful word “toshikoshi” means to climb or jump into the new year, and soba is chosen as it is gleaned from the resilient buckwheat crop which represents long life in Japan. Toshikoshi soba is eaten in the home or in restaurants around New Year, but the recipe varies. Check out our selection of potential toshikoshi soba ingredients below, or peruse our online soba recipe options. These soup stocks are ideal for adding flavour to soba dishes. This umami rich offering is another New Year’s classic. Rather like datemaki, it’s rolled shape suggests a scroll and therefore culture and learning. Soy beans in many guises are favoured around the New Year’s celebrations. These konbu flavoured ones are top notch quality. Beans in Japan are called ‘mame’, which is an other word for health. Thus, eating beans means a healthy start to the New Year! Uniquely Japanese, kamaboko is made from steaming fish. When delicately arranged in a bento, the coloured kamaboko can resemble a rising sun – a powerful image in Japan! All this talk of New Year’s cuisine got you hungry for more? Remember, we are hosting our own very special New Year’s Japanese celebration on the 2nd of January! Don’t forget, we’ve got other New Year’s favourites like mochi and konbu in store and online. We encourage you to come and visit Japan Centre Piccadilly or Stratford and ask about osechi-ryori, traditional New Year’s cuisine. Our friendly staff will be more than happy to help you out! Thanks to Kenji Uchiyama at flickr for the kazunoko image. Posted in Food and tagged Dashi, osechi, osechi ryori, Soy Beans. Bookmark the permalink.